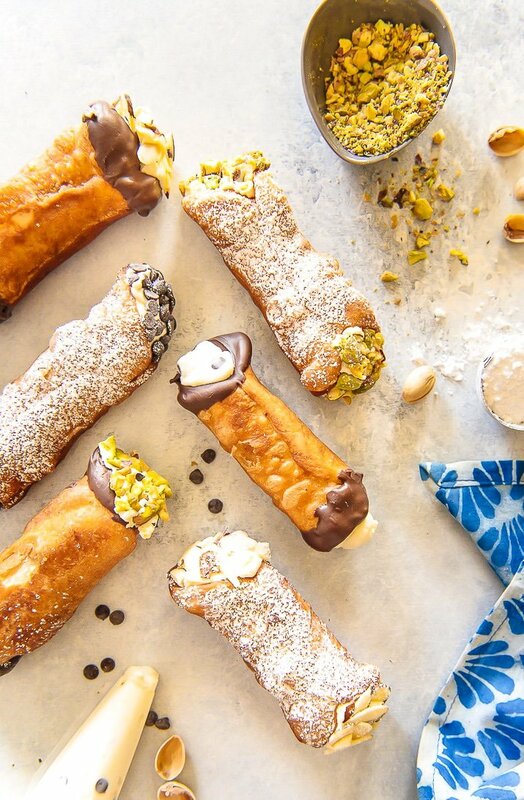 This Homemade Cannoli recipe tastes just as satisfying as ones bought from an Italian bakery. The crispy shell and creamy, sweetened ricotta cheese filling are to die for and will make any day a little extra special! 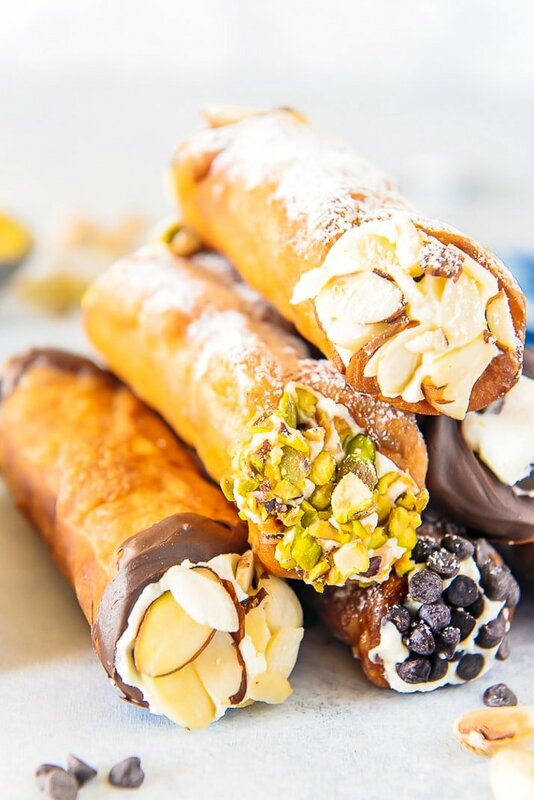 Your first batch of homemade cannoli may not look like the perfect ones you find in those fancy Italian bakeries – but I promise they’ll taste just as good. Maybe even better, since the satisfaction of checking something off your baking bucket list often tastes almost as good as the recipe itself! I’ve always wanted to make a homemade cannoli recipe, but the closest I’ve ever come was a delicious batch of Cannoli Cupcakes. They hit the spot, but they’re definitely not the same. The first cannoli I ever tried was in New Jersey about 7 years ago, in a little bakery called Carlo’s Bake Shop. You might have heard of it – it’s a popular Hoboken bakery made famous by Buddy Valastro via his reality show Cake Boss. My husband and I were driving from NYC to Pittsburgh, and it just happened to be on the way. I was a huge fan of the show at the time, so it was a given that we would be making a pit stop. It was a Sunday, and the weekend morning line to get in was pretty long, but the efficient employees made the wait bearable and entertaining. Walking into the bakery was like entering a dessert lovers paradise. The long glass cases were impeccably clean and bright, showcasing all kinds of decadent cakes and pastries. The Best Cannoli is a homemade cannoli! We were given a number as we walked in, and we just kind of gawked at everything while we waited, making our way closer and closer to the sweets. Being a cake decorator, I find myself often critiquing confections I see in bakeries, but there wasn’t a flaw to be found on any of the ones at Carlo’s. By the end of our time in the little shop, we ended up spending less than $50 but walked out with all kinds of different cookies, tiny cakes, cupcakes, and, of course, a few cannolis. I couldn’t resist. In spite of never having tried one, they had full trays of perfect-looking cream filled shells – many completely covered in chocolate, which is the one I just had to have. After grabbing a couple of slices of New York-style pizza, we got back on the road and left behind the charming town. Out of everything we purchased, that amazing Italian pastry was the first thing we devoured. To this day, that will always be my favorite first bite because of how amazing that cannoli filling was! Combine the flour, sugar, cinnamon, and salt together in a food processor. Add the butter and pulse until it resembles small pebbles. Add the egg and cold wine and pulse until the dough just barely begins to hold together. Transfer the dough to a floured surface and knead until smooth, 3-4 minutes. Wrap in plastic wrap and refrigerate for at least 1 hour. Lightly coat the dough with flour and roll it through a pasta machine set to the thickest setting. If you don’t have a pasta machine, use a rolling pin to roll the dough out as thin as possible on a lightly floured surface, to 1/8-inch thick. Use a 4-inch, round cookie cutter to cut circles from the dough. Take one circle at a time and pull it into a 5-inch oval. Repeat with the excess dough, kneading it back together and cutting it until you have 12 ovals. Place the egg white in a small bowl and set aside. In a wide pot with a heavy bottom, heat shortening or the vegetable oil of your choice to between 350 and 380 degrees F. Line a large plate with paper towels. Wrap one oval of dough loosely lengthwise around a mold or 1-inch-diameter wooden dowel. Brush one end of the dough with egg white, then pull the dry end over the top and press down to seal. Repeat with three more dough ovals. Using tongs, carefully lower the dough into the oil and fry until golden brown, turning them as they fry, 2-3 minutes. Remove the shells with the tongs and transfer them to the paper towel-lined plate to cool. When the shells are cool enough to touch, remove the molds and repeat with the remaining dough in batches. Dip ends of cooled shells in melted chocolate if desired, and let cool until dry. Place the cream in a disposable pastry bag and cut a 1/2-inch diameter piece off the end/corner. Insert the tip into one end of a shell and pipe the cream in, filling it halfway. Then pipe the rest in the other end. Repeat with the remaining shells. Dip the pastry shell in chocolate chips, crushed pistachios, and sliced almonds if desired. Dust the finished cannoli with powdered sugar before serving. How Long Do Cannolis Last? Cannolis are best right after being filled. The cream filling can cause the shell to soften and become soggy if they sit too long. However, you can make them a little in advance. 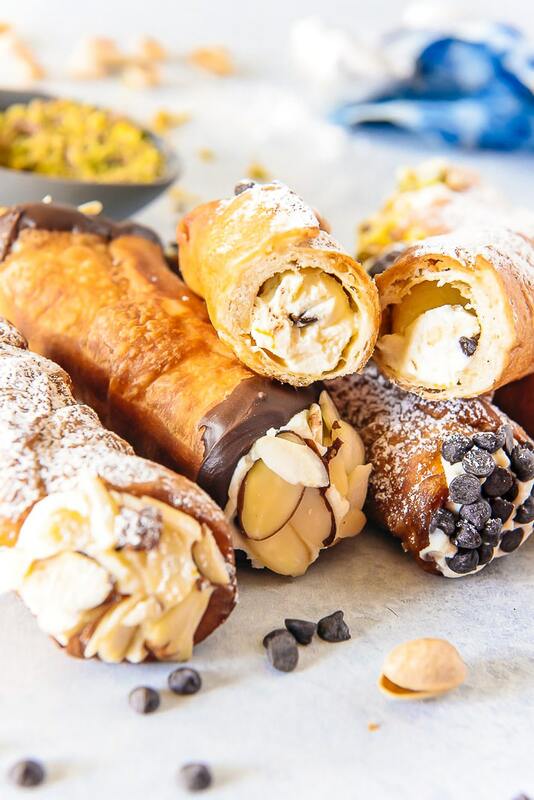 Prepared Cannolis: Store in an airtight container for up to 6 hours or in the fridge for up to 2 days. Refrigerating the cannolis will cause them to go stale quicker. Cannoli Cream: Store in the refrigerator for 1 day or freezer for up to 30 days. Cannoli Shells: Store in a sealed airtight container at room temperature for 3 to 4 days or in the freezer for up to 30 days. 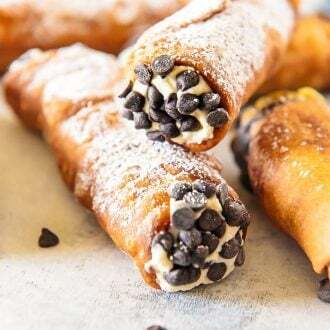 Watch How To Make Cannolis in the Video Below! Homemade cannoli are so easy to make and taste just as satisfying as one bought from an Italian bakery. The crispy shell and creamy, sweetened ricotta cheese filling are to die for and will make any day a little extra special! Lightly coat the dough with flour and roll it through a pasta machine set to the thickest setting. If you don't have a pasta machine, use a rolling pin to roll the dough out as thin as possible on a lightly floured surface, to 1/8-inch thick. When the shells are cool enough to touch, remove the molds and repeat with the remaining dough in batches until all shells have golden brown. Dip ends of cooled shells in melted chocolate if desired, and allow to cool until dry. Fried shells can be stored in an airtight container for a few weeks. When ready to fill and serve the pastry, place the cream in a disposable pastry bag or zipper bag and cut a 1/2-inch diameter piece off the end/corner. Insert the tip into one end of a shell and pipe the cream in, filling it halfway, then pipe the rest in the other end. Repeat with the remaining shells. 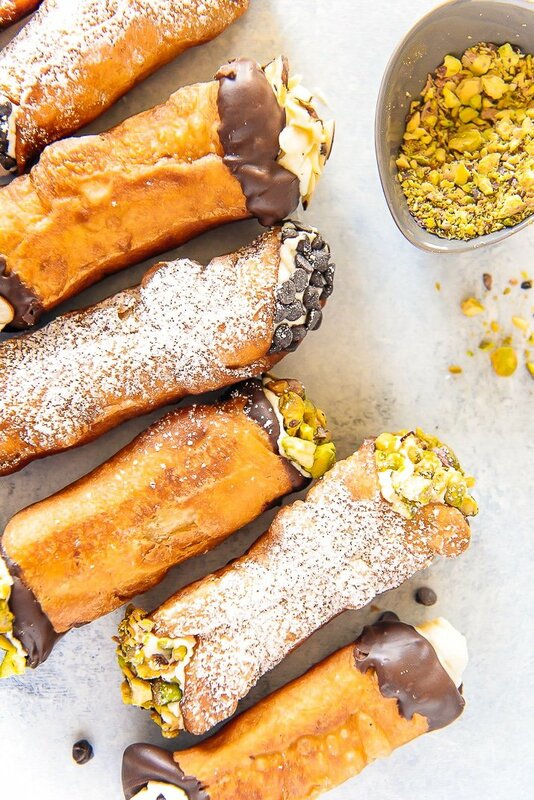 Dip the pastry shell in chocolate chips, crushed pistachios, and sliced almonds if desired, and dust the finished cannoli with powdered sugar before serving. 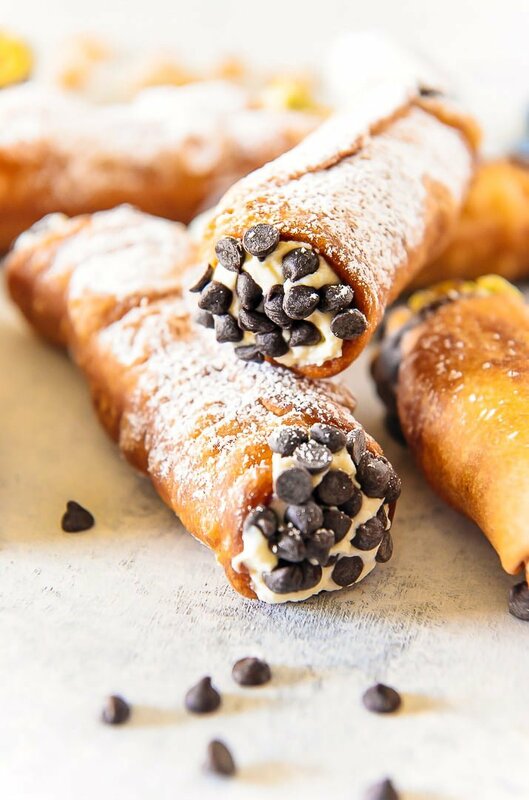 Cannolis are my down fall… ugh I just love them!! Can’t wait to try this recipe. These photos have me DROOLING! I love cannolis, but have never made my own. I am trying this recipe. These look truly amazing. I’ve always been afraid of making them at home, but you make it look so easy! Recipes like this can be a little daunting, but they are so worth the extra effort! Looks so yummy and so pretty! OMG these look soon good! I had no idea what goes into making cannolis. I wonder if I could make an egg free version? I’ve always wanted to make cannoli! Can’t wait to try your recipe! These look so incredible! I love the photos, so pretty! I’m a novice Baker so I happily take some responsibility but this dough was awful.. it got mealy and glutinous the moment I added the marsala. Good flavor, but tough to roll out thin and impossible to fry evenly. Filling is tasty and simple, don’t skip draining the ricotta! Hi Shelly, I’m sorry the dough didn’t work out for you but glad you enjoyed the filling.